Elizabeth Morland competing for Cushinstown A.C. in the long jump in Tullamore. DCU Athletics kick off their track and field action this Friday in Athlone IT for the IUAA Intervarsity Indoor Championships. They are hoping to continue the success they have had already this year, winning all the Road Relay titles in Maynooth in November. The signs look positive for another successful year as DCU athletes picked up 27 individual medals at the recent Junior and U23 Indoor All-Ireland Championships, also held in Athlone. There were 12 gold medals, eight silver medals and seven bronze medals in total at the event, with athletes also representing their clubs the day before in the Indoor National League final, again in Athlone. In case you missed it Sunday, have a look at the moment Joseph Olalekan Ojemuni, Tallaght AC sets s a New Championship Best Performance of 6.83 in the U23 Men’s 60m at the @irishlifehealth Junior & U23 championships in AIT ?? Gold medal winners hoping to continue their good form include the likes of Joseph Ojewumi in the U23 60m, who took the Championship record with him along the way. Ladies captain Sophie Becker picked up double gold in the U23 60m and 200m sprints, while the U23 walks went to Orlaith Delahunt and Shane Mooney. 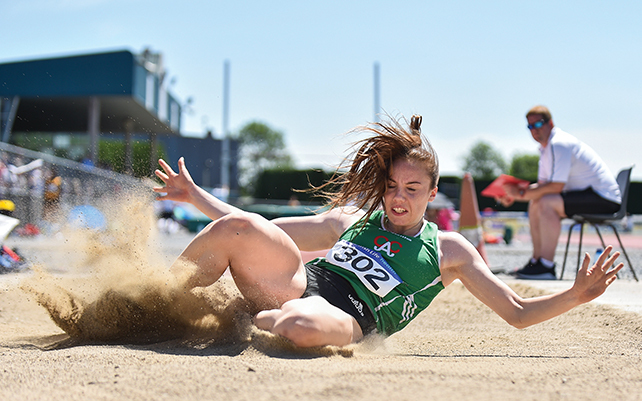 Other winners who will be going for gold in Athlone on Friday, include Michaela Walsh in the U23 shot putt and weight for distance, Keith Marks in the U23 long jump, Shane Monagle in the Junior hurdles and Daniel Hernon and Daena Kealy, both in the high jump. DCU Athletics Academy Director Enda Fitzpatrick highlighted other performers who might excel on Friday as well. Fitzpatrick emphasised the strength that DCU possess when it comes to distance running, especially after the clubs success in the Road Relays and with several athletes from the college making the Ireland team for the European Cross Country Championships in December in Tilburg in the Netherlands. The club will be looking to retain all their titles from the previous year, having produced a commanding display by winning both the men’s and women’s team competitions in 2018. Impressive displays in AIT last year came from the likes of Matthew Behan and Elizabeth Morland, who broke the competition record for the 60m hurdles and the combined events respectively as well as Gary Campbell broke the 3000m record. DCU, rather coincidentally, also happened to win 27 medals at the Intervarsity Championships last year, with the men picking up 12 and the women earning 15. Both teams finished with over double the amount of points that UL, the second placed college in both the men and women’s categories, could manage. DCU have won the last eleven team titles in both the men’s and women’s categories and will be hoping to make it twelve in a row this Friday. DCU Athletics will be hoping for a repeat performance this year as they look to complete a clean sweep of success this year. After the Indoor Championships, focus will shift to Cross-Country in March, before the Outdoor Track and Field Championships take place in AIT once again. Image Credit: Sam Barnes / Sportsfile.